This feature-length dramatic film is based on a true story of a woman's journey to healing. It is a tale of the loss of wild nature, and the threatened disappearance of the wild grizzly bear. It is also a testament to the power of imagination to heal. SEND WORD BEAR MOTHER has won the Best Docudrama award from the New York International Independent Film and Video Festival. It also won an award for creative excellence from the Earthvision Environmental Film and Video Festival. Imagine that you are running across a meadow, as fast as you can, trying to keep up with a 1,000 pound grizzly bear mother. Of course, she pulls way out in front of you, because she can run up to 35 miles an hour. Her golden auburn fur glints in the sun, and you are feeling as alive as you've ever felt in your life, and very healthy. In SEND WORD, BEAR MOTHER , the movie profiled at this website, a Woman takes a healing journey with a grizzly bear mother spirit guide --- running with her in imagination and in reality. 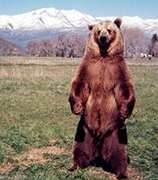 In this website, you can get to know this movie, view some photos from the movie, view production stills from the work with the golden grizzly bears who acted in the movie, find out about the staff, cast and crew who worked on the movie, and even preview a part of the movie right here online, for a small fee. You can also order VHS copies of the movie online, by clicking on our order form page. When you purchase the video, a study guide is included, which focuses on healing and the imagination, which can be used by healing practitioners and by those who are interested in a serious journey to healing. You can also find links that will be relevant to your particular focus, from the worlds of ecology, wildlife protection and preservation, women's health, environment and health, imagery and healing, and more... so, WELCOME! "This is a deeply significant personal journey that has great meaning for individual women and for the planet..."
"...a stunning film of Medicine Bear from a mainstream cultural perspective..."
"..A very well executed, artistic and inspiring film, moving us to take other species and our connection with them seriously."